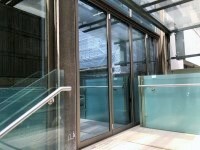 Third Floor: Bloomsbury fitness and squash courts. 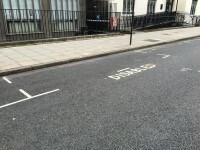 The on street Blue Badge parking bay(s) is/are located on Gordon Street. There is a maximum 2 hour stay. 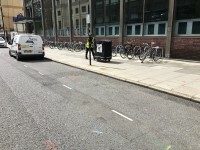 If you are driving to the Anthopology Building please be aware that it is located within the Congestion Charge Zone. Parking spaces in the area can be difficult to find. Normal Blue Badge restrictions apply. The nearest car park is Euston which is 600m away. Bus stop F is located outside Euston Station which is approximately 600m and is served by the following buses; 18, 68, 253, 476, N20, N253. 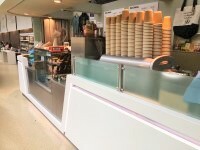 The nearest station is Euston which is 600m from Taviton Street. 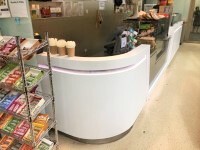 The nearest underground is Euston Square 350m away from Taviton Street. This information is for the entrance located at the front left of the building. There is / are 11 step(s) to access the entrance. 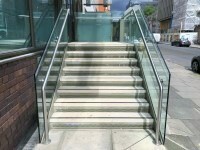 This entrance is only accessible via platform lift. 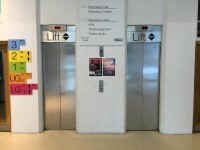 You are on Lift (Accessible Entrance Lift). Skip to the next section. 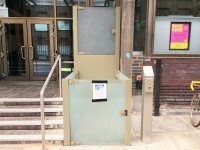 The lift is located in front of the accessible entrance. 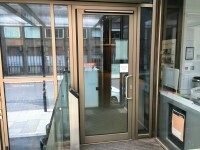 The lift is approximately 2m (2yd 7in) from the accessible entrance. 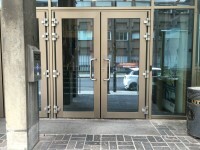 You are on Outside Access (Alternate Accessible Entrance). Skip to the next section. This entrance was not in use at the time of surveying. You are on Lift (Alternate Accessible Entrance Lift). Skip to the next section. 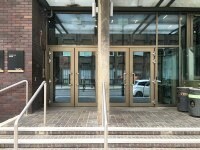 The lift is located in front of the alternate accessible entrance. 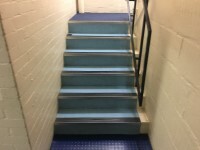 The lift is approximately 2m (2yd 7in) from the alternate accessible entrance. This lift was not in use at the time of surveying. 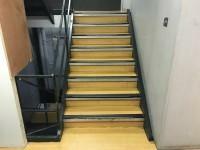 There is an easy ramp, with no handrails, for access to the studio space room on the lower ground floor. 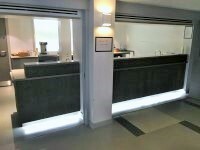 Photograph 1 shows the ramp leading into the studio space room. Photograph 2 shows the studio space room. 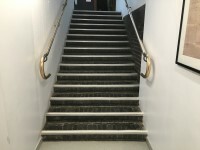 There is/are 6 clearly marked step(s), with a handrail on the right going up, for access to the dressing rooms, wardrobe room and green room via the rear of the studio space room. 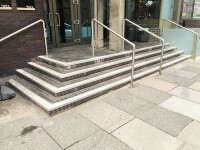 These steps are shown in photograph 3. 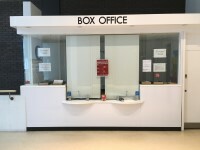 The box office is located to the left as you enter. 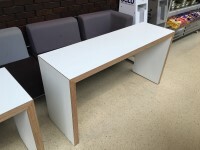 The desk is 10m (10yd 2ft) from the accessible entrance. 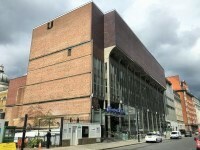 You are on Theatre (Bloomsbury Theatre). Skip to the next section. The theatre was closed for refurbishments at the time of surveying. It is due to be reopened in 2018. You are on Eating and Drinking (Bloomsbury Cafe). Skip to the next section. 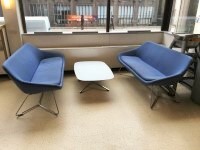 The nearest table is 3m (3yd 10in) from the accessible entrance. 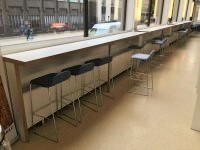 The distance between the floor and the lowest table is 34cm (1ft 1in). 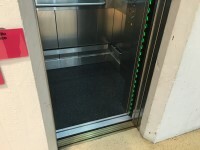 The floors which are accessible by this lift are LG-UG-1-2-3. 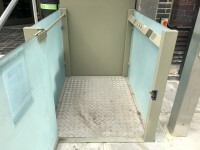 The lift is approximately 8m (8yd 2ft) from the accessible entrance. 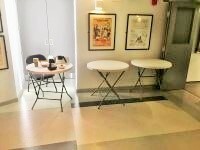 The theatre facilities are located on the LG and UG floors of the building. 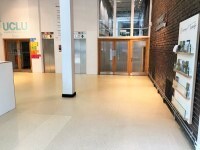 Floors 1, 2 and 3 comprise of student union facilities. 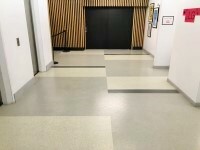 The floors which are accessible by stairs are LG-UG-1-2-3. Photograph 2 shows the stairs between the lower and upper ground floors. You are on Eating and Drinking (Studio Bar). Skip to the next section. The nearest table is 8m (8yd 2ft) from the lift. The type of food served here is drinks. 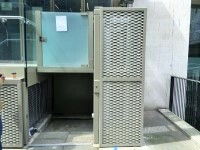 This accessible toilet is 17m (18yd 1ft) from the accessible entrance. 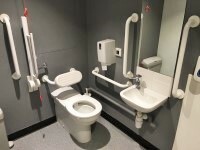 This accessible toilet is located ahead as you enter on the upper ground floor to the rear of the building. 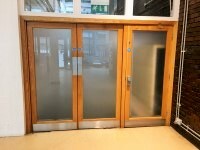 There is a similar accessible toilet located on the lower ground floor opposite the lift. This toilets transfer space is on the right. 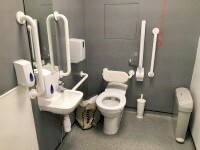 The dimensions of the accessible toilet are 170cm x 250cm (5ft 7in x 8ft 2in). 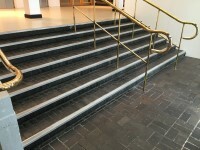 A radar key is also needed for the accessible toilet on the lower ground floor. This can be obtained at the studio bar. 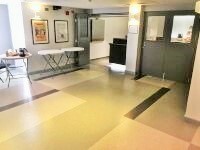 There are male and female standard toilets facilities on the lower ground floor and the second floor. 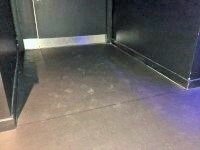 The standard toilet surveyed is approximately 18m from the lift. 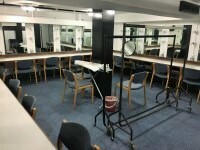 The toilets on the lower ground floor are only open when events are taking place in the Bloomsbury studio. The second floor toilets are the only available toilets during the day in this building. 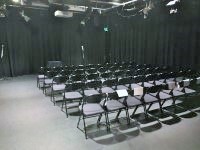 To view the full Estates fire safety handbook/ Emergency Plan for Bloomsbury Theatre please click here (new tab).